Everything is Nerfed: WoW Legion Pre-Expansion Patch Now Live! Update:The pre-Legion patch is live! Hop in to see how Blizzard has nerfed your class in particular, or just to get a jump on the next expansion! Blizzard Entertainment has announced that the promised World of Warcraft: Legion pre-expansion patch will be going live on July 19. The patch begins the story of Legion, while also giving players some of the new Legion features before the expansion's full launch on August 30, 2016. A few features will go live immediately, while others will be rolled out over the next few weeks. All of the pre-expansion patch features will be available to all players, with the exception of the Demon Hunter class early access, which is only available to those who pre-order Legion. The first immediate addition will be all of the changes being made to each class for Legion. The new and rejiggered spells and talents will go live, giving players a chance to see how their chosen class and specialization will perform in Legion. As an added bonus, Blizzard is also allowing players to queue for dungeons, raids, Battlegrounds, or Arenas with any available role - Damage, Tank, or Healer - while they continue to play their current role. This means you can queue for a dungeon as a Healer, while still remaining in your Damage spec for questing. My most-anticipated new feature that will launch on July 19 is the all-new Transmogrification system. Currently, to Transmog to a different armor skin, you have to physically own that piece of armor. This led to players with banks full of old equipment that they were holding onto, just in case they wanted to switch to that skin. 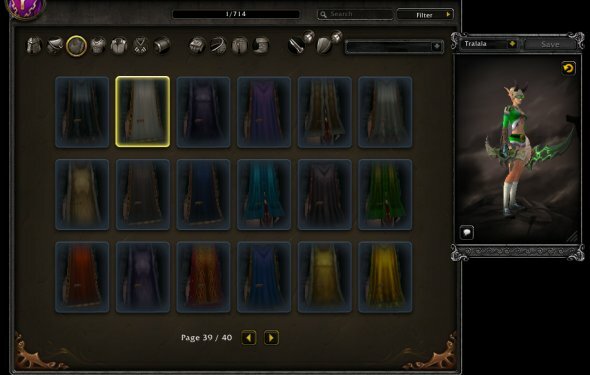 The new Transmog system works like Guild Wars 2's Wardrobe system: once you've acquired a piece of armor, it's automatically unlocked in Collections. "With the Legion pre-expansion patch, every piece of gear that is bound to your character permanently unlocks that item's appearance for you. Even if you sell or destroy the item, you'll always be able to look through the new Appearances tab in the Collections window to find its look, " said Blizzard in a separate post about the new Wardrobe. As a fan of Transmog, this is a much-needed change that will open up a ton of space in my bank. The current system had its heart in the right place, but ended up being absurd and unwieldy. The new Collections windows also includes the Adventure Guide, which can show you what gear is out there, how you'll look in that gear, and where to find it. The rest of the events and features will be a part of the slow rollout leading up until the launch of Legion on August 30. This includes Burning Legion invasions, which change certain regions of Azeroth into battlegrounds against the demon invaders. The Broken Shore, the place where the fight against the Legion truly begins, will also be rolled out at some point. Finally, there's the Demon Hunter early access period for those who pre-purchased the Legion expansion. Blizzard is expecting that content to go live on on the second or third week of August, but no later than the August 17. "Players will begin at level 98 and will find themselves on the fel-shattered expanse of Mardum, where they'll play the Demon Hunter starting experience before joining their allies in the fight against the Legion, " explained Blizzard. Metal bands feel at home on the Broken Shore. Blizzard is working to address players complaints regarding previous expansions Mists of Pandaria and Warlords of Draenor. Draenor specifically had a huge void of content for players. World of Warcraft's last content patch was 6.2, which launched in June 2015 and offered up the Hellfire Citadel raid and the rest of Tanann Jungle. The dev team is promising that this won't be the case with Legion. 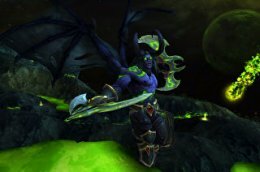 "The most important thing is getting our players a steady stream of content and making it feel like they're playing a living game and a living world, and we feel what we're coming out with right out of the gate in Legion is going to keep players engaged and challenged and entertained for quite a while to come, " assistant lead designer Ion Hazzikostas told IGN. "We have a much more robust patch plan for the Legion expansion that we're going to talk about at some point in the future, " WoW executive producer J. Allen Brack added. "It's a lot more stuff, a lot more content."